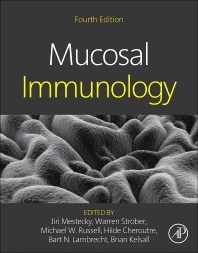 Mucosal Immunology, now in its fourth edition, is the only comprehensive reference covering the basic science and clinical manifestations of mucosal immunology. Most infectious agents enter the body through the various mucous membranes, and many common infections take place in or on mucous membranes, making this subject an area of singular importance in the field of immunology. This book contains new research data, exceptional illustrations, original theory, a new perspective, and excellent organization. It covers immune system topics, such as inductive and effector tissues and cells, and development and physiology of the mucosal barrier; diseases in the digestive system, respiratory tract, and genitourinary tract; and immunodeficiency. ILCs and Adaptive Responses: Redundant or Complementary? Acute Epithelial Responses to Respiratory Viral Infection: Inducing the "Antiviral State"
RAd5 and HIV-1 Step Study: Guilty and Condemned or Wrongfully Used and Prematurely Convicted? Why Don’t Men Develop Autoimmunity to Sperm? Under What Conditions Do Men Develop Autoimmunity to Sperm? Why Don’t Women Develop an Immunity to Sperm? University of Alabama, Birmingham, AL, U.S.A.